Your home is your palace, your home is your pride and joy and keeping the it in tip top condition for yourself and guests is the top priority. Once the inside of your house is organized, cleaned and swept spotless the garden and outdoor area is the next objective. As a homeowner, this means keeping that lawn nice and tidy (unless you happen to live in a city like Las Vegas where desert is your lawn instead of grass). Buying a suitable lawnmower for your garden or outdoor space is no easy task as there are already hundreds on the market to chose from with new models being released each week. All do different functions and work best in different environments not to mention differences in difficulty and man power required to operate. Let us break down the different types of options available to you, some common features to look for, and reviews of our favorite riding and self-propelled lawn mowers on the market this year. There are many variables to take into consideration before purchasing your first (or second) lawn mower. Perhaps the most important is the size of the area you want to operate it on, is it a smaller area that needs a little upkeep from time to time or a larger area that needs lots of care. Another thing to note is your size and strength level, sure you’re buying a product here so it may feel weird to put yourself under the microscope but it’s crucial. How strong and big you are will affect the type of lawn mower you can purchase and operate effectively. And honestly, there is no sense in getting a powerhouse of a mower if you can’t even operate it well to take full advantage of it, right? As you compare all of the top lawn mowers on the market this year, you will notice that prices tend to vary quite a bit. You can find lawn mowers under $100, $200, $300, $400, $500, $1000 and on up. 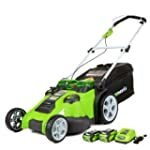 If you are on a tight budget, then the links below will take you to your preferred price range on Amazon so that you can easily compare mowers that are affordable for your family. There are two types of lawn mowers to choose from: electric and gas. Let’s start with electric mowers; these are perfect for small to medium sized gardens and as mentioned above your size comes into this, if you’re small to medium sized an electric mower is the one for you! Another plus point of owning an electric mower is they’re more economical in the long term and environmentally friendly in that they don’t required added fuel. One of the downsides to an electric mower is that it requires a cord at all times (unless you buy cordless for extra), less power than a gas alternative and the length of the cord will greatly impact the distance you can freely travel around the lawn. If you decide to buy a cordless electric mower however factor in the added price. Let’s move onto gas mowers now, as the name suggests they run on gas and so are extremely powerful. They’re ideal for medium to large sized lawns as the propeller is fit for larger spaces. If you have thicker grass or want to save time this is the choice for you. Ideal for businesses and corporate settings. You’ll notice the little details such as no cords and how quickly they cut through grass will make your experience less pain staking and time consuming than an electric model. The few downsides to a gas mower include: the price for fuel and ongoing maintenance of the engines, price of added fuel (so less economic in the long run) and noise disturbance from the engines. Keep in mind while these downsides are annoying they only exist for the function of the positives and for large businesses and corporate events a heavy duty lawn mower isn’t just an added bonus but a requirement. Finally there are manual and self propelled mower types for you to choose from. Self propelled are a lot easier to use, especially for weaker and older people, but manual models are slightly less expensive at that. After comparing all the top rated lawn mowers on the market this year, we have gone through the list of the final 10 models up above and want to share our thoughts with you. Below you will find some mini reviews for our top picks. 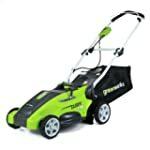 If you are considering buying one of these cheap lawn mowers, then we hope that our reviews make it easier for you to compare lawn mowers and made a decision on which is the best one for your yard at home. Whether you need a good lawn mower for a small yard, for hills, or a large yard, I think you’ll find something for any size yard here. GreenWorks is known for making quality home equipment and this electric yard mower is no exception to that. We like that this feels like a high quality and durable grass mower that will last for years to come. It is a good choice for small gardens and yards, though it’s 10 amp motor might not pack enough punch for some home owners. Of course, it is a bit quieter than a 12 amp motor. Overall, we find that the 10 amp motor offers enough power to get the yard mowed in a reasonable amount of time. For an yard about 1800 square feet in size, we estimate that it took around 45 minutes to complete mow the yard with this machine. 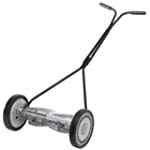 This is a very lightweight electric push mower, which makes it a good lawn mower for teens, women, and the elderly. We like that this mower is easy to maneuver, starts up quickly and easily, and is relatively quiet for lawn mowers. It also has a grass catcher bag in the rear that is easy to use, though it might be a tad small for those with large yards. It’s also important to note that this mower has mulching capabilities. With an affordable price, good build and solid features, this GreenWorks mower is a good choice for a lot of home owners. If you want to buy the best gas powered lawn mower for the money, then we definitely recommend this Craftsman model. It has that old school look that you’re used to and it can handle even big yards with no problems. The engine has enough power to get the yard mowed quickly. And if you notice the larger wheels on the back – well, those are specially designed so that it takes you less effort when you need to pull it back towards you. Pretty cool, huh? This is a 3-in-1 mower because it can side discharge the grass clippings, collect them in the included bag for you, or mulch the grass clippings. Overall, this mower is reasonably light weight and works well on yards of all sizes. Since it is gas-powered, the noise level is higher than what you get with an electric model. And starting it up seems easier than the old gas mower that we grew up with. 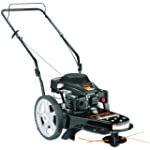 Overall, this is one of the best high quality gas lawn mowers with an affordable price. If you are on a budget and need a good, cheap electric lawn mower, then this Sun Joe model is a great choice. It has a very affordable price, which makes it a great choice for an inexpensive lawn mowers. We also find that this Sun Joe model is very easy to maneuver in tight spaces, so it works well in yards that have tricky spots that larger mowers won’t easily fit into. Since this is an electric model, it works best for small yards and gardens because you don’t want to have to deal with a massively long extension cord in a large yard. 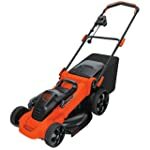 We also find that the 12 amp motor gives this small lawn mower a lot of kick, and it is really all the power that you need to get the job done. We also like that the top of this Sun Joe mower catches the grass so that you can easily dispose of it when you’re done. And since the catcher is hard-top, it is much easier to get all the grass cuttings out. Start-up on this lawn mowing machine is also very easy since it is a push-button start. It is designed so that just one push and it starts right up the first time, every time. This is a very lightweight electric lawn mower, which makes it a good choice for older people and those with less upper body strength. It does have a height adjustment so that you can choose from three different heights, but we find that it is not the easiest thing to change. That is really our only complaint with this Sun Joe model so far. If you don’t want a gas mower or an electric mower, then this GreenWorks model is a great choice for you. It is one of the best battery-operated cordless lawn mowers on the market this year. It comes with two 40V Li-Ion rechargeable batteries and a battery charger. The nice thing about having a good battery-powered lawn mower is that you can tackle a large lawn without having to deal with an extension cord. Plus, it is more quiet than a riding mower or a gas-powered mower. We find that this mower is easy to maneuver and it works best with mid-size lawns, but also performs well in large yards. A really cool feature on this one is that the mower will automatically switch to the second battery to draw power once the first battery runs out of juice. This means that you don’t have to stop mowing to change out the battery. Great feature, huh? And if you’re wondering how long you have on a fully battery charge, you get 60 minutes for each battery. So, that’s a good long time to get the grass cut! You can opt to collect the grass trimmings in the bag for disposal or for mulching. Despite the larger size of this one, it is still a lightweight cordless lawn mower. We think it is light enough for teens, ladies, and people with little upper body strength to use on a regular basis. One thing to keep in mind though is that it does not do well in tight spaces, so if your yard has a lot of odd corners and small areas, then this is not a good choice for you. If you have a big yard to mow, then you will love this EGO Power+ battery-operated lawn mower. It runs off a 56V Li-Ion battery and it has the power of a gas mower. We were really impressed with the power that you get from this mower. Even better, when the battery is fully charged you can cover 2 miles of grass before it needs recharged, or about 45 minutes. And it only takes 30 minutes for the battery to fully re-charge! Another thing that we really like about this one is that it folds up for easy storage. Seriously, this thing is very compact if you need a small folding lawn mower because you have limited outdoor storage space. Like one of the models above, this is a 3-in-1 mower where you can opt for a side discharge of the grass cuttings, collect the trimmings in a bag or mulch them. It is easy to use and it is a quiet lawn mower for big yards. 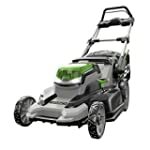 Finding the perfect lawn mower for your needs that is within budget is a difficult in itself especially if you don’t have prior experience buying. A lawn mower is essentially an investment of your hard earned cash for the long-term upkeep of your home. Therefore it makes sense that you want to get the best bang for your buck and that means keeping your new lawn mower in tip top condition and lasting as long as possible. Below are several easy to implement maintenance tips for newbies as well as long time lawn mower owners too. The lawn mower is a regularly used piece of equipment in the garden and therefore weekly upkeep is imperative in order to keep it working in the best condition, clean and saving money on fuel to keep running economic and environmentally friendly. Basic tasks to complete every time you mow your lawn include surveying the lawn before hand and diagnosing potential hazards and obstacles that would harm your lawn mower, try to avoid getting items stuck in the blades. Once it has stopped running, after each and every use take a broom to the mower cleaning it thoroughly of grass, sticks and stones and cleaning it down properly paying close attention to the blades and clearing any obstructions there. Weekly tasks include inspecting the air filter for debris and stones, keep all air filters clean and clear of any obstructions. Replace paper filters when required and clean plastic filters with warm water and soap, drying thoroughly and returning to their proper position. Check and change oil regularly too, a good gauge of when to change oil is when it gets dark. Oil starts an orange golden color and goes darker the older it is so it’s easy to tell. The blade is the most important part of the mower that effortlessly cuts through grass as you drive across your lawn. As time goes on the blade gets duller and duller due to use, you can sharpen the blade multiple times but eventually it will have to be replaced. Another important maintenance task is replacing the spark plug. It’s recommended to check your spark plug is in good working order every time you replace paper filters. Otherwise replace every season. Winter care is important. Get rid of any old unused oil and set it aside for recycling. Do regular maintenance tasks such as clearing blades and washing off debris as well as replacing air filters as needed ready for the spring season next year. Then store in a dry safe space for when it time to use again, lubricate in order to prevent rusting.